This is the User Manual for Valkyrie1564. Valkyrie1564 is a PC application that lets you perform advanced network tests according to the ITU-T Y.1564 standard using one or more of the Xena test equipment chassis. This manual contains a high-level introduction and a few usage scenarios to get you started with using the Valkyrie1564. Refer to the Valkyrie1564 Reference Manual for a detailed description of all the various configuration options in the application. 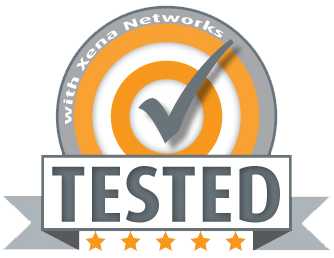 Enables the user to create, edit and execute test configurations using Xena Networks test equipment in accordance with the ITU-T Y.1564 standard. Define test configuration using standard MEF 10.2/ITU-T Y.1563 terminology. Full support for both Y.1564 configuration and performance test types. Ability to define multiple Ethernet services. Ability to execute test on one, several or all defined Ethernet services. Ability to organize defined services in a custom folder hierarchy. Support for different network topologies and traffic flow directions. Support for both layer 2 and layer 3 testing. Support for either IPv4 or IPv6. Ability to flexibly define the protocol layers supported by each user-to-network interface (UNI) – Ethernet, Customer and Service VLANs, MPLS, IP and UDP. Ability to define either per-UNI or per-CoS bandwidth profiles for each UNI. Ability to specify CoS-to-DSCP mapping. The application uses a tabbed panel layout to divide the functionality into separate areas. The following sections briefly explain the main areas of the GUI. The main Valkyrie1564 application view is shown in the image below. The toolbar providing easy access to the most needed functions in the menu bar. The main tabbed panel containing the function panels. The service tree view showing all defined services and their UNIs. Content of the main tabbed panel. The results grid and plot panels – here shown in hidden state. The status bar showing current status and progress information. For more details on the general functionality refer to the Reference Manual. This section explains how to create a few common test configurations. In this scenario we will create a simple EPL service with no VLAN multiplexing on the UNI (i.e. port-based) using plain Ethernet traffic. Click the Add Chassis button in the main toolbar. This will display the dialog shown below. Enter the IP address and password of a Xena chassis and press OK. Create a new Ethernet service either by clicking the “Create Service” icon in the small toolbar at the top of the Defined Services tree panel, located at the left part of the application, or by right-clicking on the “All Services” root in the Defined Services tree panel and selecting the “Create Service” menu option. This will display the dialog shown below. Enter a suitable label for the service to make it easy to identify it later on. Set the Service Type to “EPL” (should be the default choice). Leave the Is Virtual Service checkbox unchecked as we want to define a port-based service. Optionally modify the Service Acceptance Criterias to use in the test. These values represents the guarantees you want to issue to the user of the service as part of the Service Level Agreement (SLA) for this service. If one or more of the criteria should not be used in the test you can deselect them using the Use in test checkboxes to the right. Finally you need to specify the Testflow Characteristics. For an EPL you can only select the “Pairs” topology as the other topology options are only relevant for multipoint configurations. You can however select the direction for the test traffic. You should keep the default choice of “Bidirectional” for this test. Press the Create button to create your service. Switch to the Bandwidth Profiles panel and click the “Create Profile” button in the small toolbar at the top of the panel. A new entry will now be inserted in the list below. If you cannot see theBandwidth Profiles panel tab in the tabbed view you can either enlarge the main window until the tab pops into view or you can select the Bandwidth Profiles menu item in the View menu. Alternatively you can click on the little down-arrow in the right edge of the tab-bar and select the Bandwidth Profiles panel. Click the cell in the CIR column and enter the committed bandwidth you want the UNIs to provide. Optionally click the cell in the EIR column and enter the additional excess bandwidth you want the UNIs to provide. You can also optionally modify the CBS and EBS values. The default value for both is 12176, according to MEF 13, clause 36. Switch to the Physical Ports panel. Expand the module(s) as needed and locate two ports that you want to use in your test. Select the ports, either one by one or both at the same time, drag them to the service you created in the Defined Services tree view and drop them onto the service. The two UNIs will now be shown under the service in the services tree view. Notice that the cells under the Group column contains the text “Select Group…”. Change this value to “EAST” for the first UNI and “WEST” for the other. Switch to the Service/UNI Configuration panel. Select the first UNI to view the UNI configuration panel as shown below. For this test we will just leave the default traffic settings (plain Ethernet, no VLANs, no IP, etc). Select the Ingress Bandwidth Profiles sub-tab and set the Per-UNI Bandwidth Profile to point to the profile we just created. Do the same for the other UNI. Save your configuration and give it a suitable filename. Click the “Start Configuration Test” button in the main toolbar. The Result Data Grid panel will now be shown automatically. Here you can follow the progress of the test. Once the test completes the resulting PDF report should open automatically in the default PDF viewer application on your PC. This example expands a bit on the first example and will thus only describe the new features in details. You can either use the same configuration as for the first example or you can create a new configuration. Add a Xena chassis to the configuration (or re-use the one you already have). Create a new Ethernet service. Set the Service Type to “E-LAN”. Set the testflow topology to “Mesh”. Select 3 suitable ports in the Physical Ports panel and drag&drop them to the service you just created. Set the Per-UNI bandwidth profile for each UNI to a suitable bandwidth profile (reuse the one you created before or create a new one for this test. Right-click on the service you just created in the Defined Services tree view and select the “Run Configuration Test” (for this service only) item. This example also expands on the first example and shows how to add service multiplexing using a Customer VLAN tag (C-TAG) and also how to enable per-CoS bandwidth profiles. We will create an EVPL service with a C-TAG value of 10, using bandwidth profiles for CoS value 1 and 5. Create a new Ethernet service. Set the Service Type to “EPL” and check the “Is Virtual” checkbox. Go to the Bandwidth Profiles panel and create and configure two new profiles, one for each CoS value we want to use. The CIR/EIR values should preferably be different so that you can see a difference when you run the test. Add two suitable ports to the service. Assign each of the ports to a different direction group (EAST or WEST). Select both UNIs in the tree view and change to the Service/UNI Configuration panel. Check the VLAN: Customer Tag checkbox and set the C-tag value in the Frame Editor to 10. Change to the Ingress Bandwidth Profiles tab. Select the Use Per-CoS Bandwidth Profiles option. Press the Add button. Set the CoS value to 1 and select the first profile you created above. Ignore the DSCP settings and press OK.
Add another CoS-profile mapping for CoS value 5. This example shows how to setup IP traffic on a service. Create a new Ethernet service. Set the Service Type to “EPL”. Change to the Physical Ports panel. Select two suitable ports to use and assign an IP address to each in the configuration panel at the bottom of the main port panel. Optionally assign a gateway address as well if your network setup requires this. Add the two ports to the service as UNIs. Assign each of the UNIs to a different direction group (EAST or WEST). Select both UNIs and enable IPv4 Header in the Frame Configuration. Also assign a bandwidth profile to each UNI. Please refer to this page for further details about troubleshooting the Valkyrie1564.